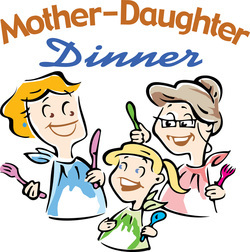 We will be having our annual Mother/Daughter Dinner on Friday, April 29th, 2016 at 6:00 p.m. The cost is $7 for adults, $4 for ages 6-12, and free for children 5 and under. Chicken dinner will be cooked and served by the men of the church. We will be doing some painting. Please wear older clothing or bring an old t-shirt that you wouldn't mind getting paint on. To make reservations, please call Linda Morey at 226-6402.